Though some heroes come brandishing a sword or a super power, one Alaska Airlines customer comes equipped with miles and the power of social media. 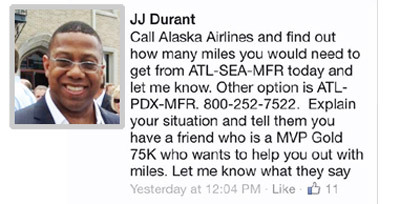 When Cecily Craighill missed her flight from Atlanta to Eugene, Oregon, on a different airline, James “JJ” Durant, an Alaska Airlines MVP Gold 75K, came to her rescue on Facebook. Little did Craighill know, a high school friend was about to rescue her. Durant, a federal account manager in medical sales, was onboard an Alaska Airlines flight between Seattle and Las Vegas when he saw Craighill’s post. Durant has been an MVP Gold 75K for the past three years and flies weekly on Alaska. Craighill spoke with three customer service agents at the Alaska Airlines Call Center who were able to give Durant’s miles to Craighill so she could make her trip. Not a Mileage Plan member? Join today and start earning your way to your next superhero moment. What’s the coolest thing you’ve done with your miles? 2 comments on "A reason to ‘like’ Facebook"
I love reading stories like this! Makes me so proud to have retired from this great airline and want everyone to know how proud I am and to support this great airline with a HEART! 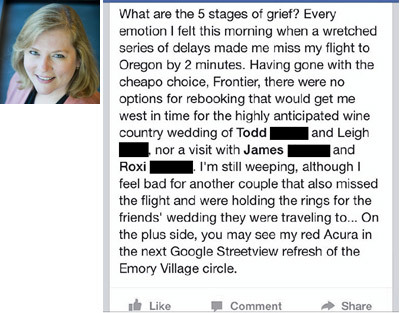 As a retired Alaska Airlines employee, it’s stories like this that make me proud. Thank you JJ Durant for your kindness and generosity.